There may have been better movies at this year’s Tribeca Film Festival, but none was timelier than Havana Motor Club. This thrilling and sobering documentary arrives just as President Obama and Raúl Castro are taking steps to close the half-century-old rift between the United states and Cuba, the last dusty relic of the Cold War. Havana Motor Club, written, directed and produced by Bent-Jorgen Perlmutt, uses the history and current state of car racing in car-crazed Cuba as a lens for examining the island nation’s divided emotions as it gets ready to navigate a treacherous crossroads — the place where communism and capitalism intersect and collide. Through archival footage, we learn that the 1958 Havana Grand Prix attracted ecstatic throngs — only to end in tragedy when a car spun into the crowd, killing 10 and seriously injuring 40. When Fidel Castro and Che Guevara led their triumphant rebels into town the following year, toppling the corrupt American puppet Fulgencio Batista, they promptly outlawed auto racing as “dangerous and elitist.” It was a sign of things to come: communism, Cuban-style, was not going to be a lot of fun. As it turned out, there was no way Fidel or anyone else could thwart Cubans’ love for cars, especially Detroit iron from the 1950s. Havana Motor Club follows a pack of gear heads as they work on their Chevys and Thunderbirds with minimal tools, improvised parts, and astonishing ingenuity — then race them surreptitiously. 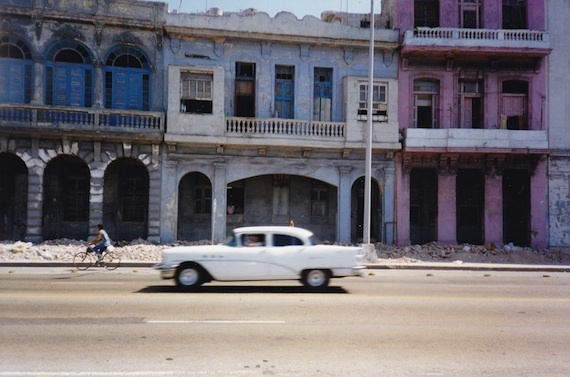 The streets of Havana look lovely through the windshield of a speeding ’55 Chevy. All the while, these men struggle to bring back legitimate, sanctioned races. “The hardest thing about living here,” says Joti, one of the racers, “is that there’s no life for an honest man.” He should know. He sold off his tools and then his car, piece by piece, to finance a string of failed attempts to reach Florida by raft. Eventually he gave up and resigned himself to life in a country where the average wage is $20 a week and just about everything is scarce, from auto parts to gasoline to food. The recent easing of economic and travel restrictions under Raúl Castro — a sharp break with the rigid anti-American policies of his older brother — has left many Cubans feeling deeply divided. One of the gear heads in the movie notes that he got treated for cancer — for free — even though he has trouble putting food on the table. These men are fiercely proud of the revolution, yet frustrated by the hardships brought on by the U.S. embargo, the collapse of the Soviet Union, and the undeniable failings of the revolution itself. They yearn for change but don’t want to abandon life-long beliefs. Havana Motor Club beautifully captures their ambivalence. I share their ambivalence. I also share their love for cars from Detroit, where I grew up during the American auto industry’s golden age, the 1950s and ’60s. For years I dreamed of visiting Cuba, but I wanted to see the place while Fidel was still in power, before it opened its doors to the ghastly glory of American consumer goods. I wanted to see the country before it becomes dotted with Marriotts and McDonald’s, before it becomes another Thailand. (For the same reason, I visited Francisco Franco’s Spain the 1970s, Haiti during Baby Doc Duvalier’s reign in the 1980s, then Myanmar, Laos, and Vietnam in the 1990s.) I don’t romanticize dictatorships or totalitarian states, but I do believe that one of the best ways to understand American capitalism is to see how people live — for better and for worse — without our gaggle of consumer goods, our putative freedoms, our unquenchable hunger for the latest new thing. And so in the spring of 1998 I flew from Miami to Nassau, and from there –illegally — to José Martí Airport in a rattling, smoking, terrifying Air Cubana jet. (The obliging customs agent in Havana neglected to stamp my passport, so I wouldn’t run afoul of American authorities when I returned to Miami.) In my pocket I carried my calling card — a photograph of the lipstick-red and garter belt-black 1954 Buick Special I owned at the time. I had not come for the usual tourist attractions — the cigars, the music, the rum, the architecture, the beaches, the girls. I had come to seek out fellow geeks who love vintage Buicks. Even back then, Fidel had reluctantly allowed a limited, dollar-based, shadow economy — a necessary response to the hardships brought on by the long-standing U.S. embargo and the recent collapse of the Soviet Union. I took advantage of this legal shadow economy to rent a rooftop room in a private home near downtown Havana, a so-called paladar. These businesses, which often offered home-cooked meals, were among the few places to find edible food. Everything was scarce. Cuba was once the world’s largest exporter of sugar. When I visited, the only place to buy white sugar was on the black market. Cubans laughed darkly at such ironies. On my first morning, I stepped to the edge of my rooftop terrace and beheld the weird magic of the time warp I had entered. Parked across the street was a faded, mustard-yellow 1959 Cadillac Coup de Ville. Actually the car had been left there to die. The sun roof had stopped working, like so many things in Cuba, and the hole was plugged by a sheet of cardboard. The mammiferous chrome tips of the Dagmar front bumper were speckled with rust. The tires were bald and the back seat was full of soggy junk. The soaring fins and the twin bullet taillights hinted, just barely, that this car represented Detroit at its zenith. Then it hit me: 1959, the year Detroit pulled out all the stops, was also the year Fidel and Che marched into Havana and banned auto racing and all other vestiges of capitalism. The symbolism and the symmetry went even deeper. That mustard-yellow ’59 Cadillac was not only the same age as Fidel’s socialist dream, it was in roughly the same shape. This became increasingly apparent as I bicycled around the city, astonished by the sight of so much once-glorious architecture literally crumbling into the streets. Everywhere I went, I struck up conversations with Buick owners. One was Jorge Gallarde, who spotted me admiring his immaculate burgundy ’57 Buick Special parked in a long row of taxis across the street from the National Capitol. After I showed him the snapshot of my ’54 Buick, he started telling me his story. In doing so, he was swimming against the current of thousands of other Cubans who were streaming to the U.S. and Europe, an exodus of people, technical expertise and capital from which the country has never fully recovered. “I bought this Buick shortly after I got back,” Gallarde went on. “It was still fairly new then. I drove it to my wedding. I drove it many times to the beach at Jibacoa, where my family had picnics on the weekends.” He gave the car a dreamy look as he told me about his travels in the Buick and his love for America and things American, a common sentiment in Cuba. I asked him if he had any regrets about coming back home, in light of the way things turned out. When I asked if I could have a look under the hood, he gladly complied. Cubans are justly proud of their mechanical ingenuity. Jorge had installed a diesel engine as a hedge against high gasoline prices. His fatalism is a very Cuban mechanism for coping. It brings to mind Joti, from Havana Motor Club, whose repeated failures to reach Florida by raft left him resigned to his life in Havana. These men understand that there’s no future in second-guessing history. A few yards away, a battered Caribbean-blue 1951 Buick Super had paused to catch its breath. The taxi’s owner was leathery, whiskery, with sunglasses perched on his nose and a crumpled fedora on his head. The side-hinged hood was raised, and the owner, Ramon Velasquez, explained that it had overheated and he was letting the engine cool. I showed him the picture of my ’54 Special. 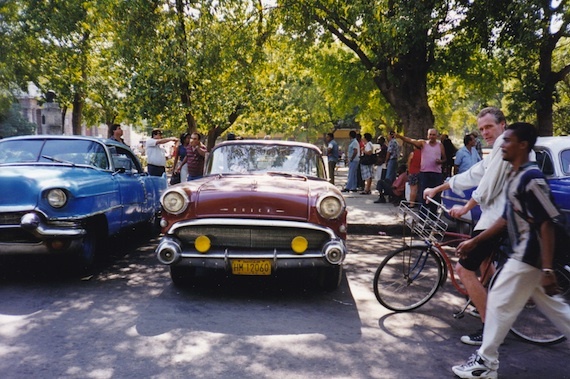 Cubans’ familiarity with American cars nearly surpasses their affection for them — and their ability to keep them running. Ramon pointed out the Rambler carburetor he’d installed, plus the clothes pins clamped on the fuel line to absorb heat and prevent vapor lock. There was more than a little duct tape on the porous radiator hoses. When the engine finally cooled, Ramon closed the hood and fired her up. It sputtered, belched black smoke. This bucket was nearly half a century old, and the only reason it was still running was because it had to. It was Ramon’s livelihood. Watching it melt into the scrum of Havana’s midday traffic, I was thinking that in America that car would have been turned into scrap years ago. So, I asked myself, which country is richer? 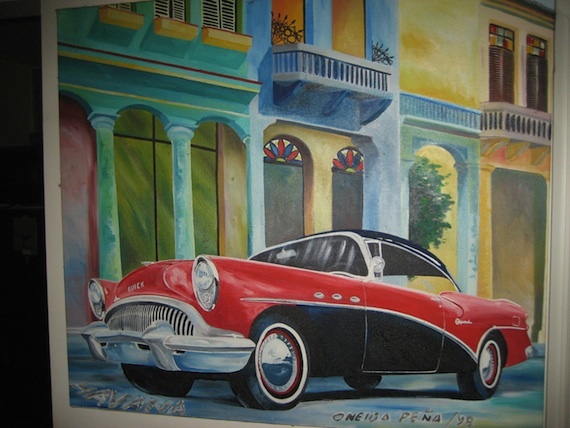 Before returning to Miami, I found a street artist near the cathedral whose work I liked — she specialized in painting American cars — and after showing her my snapshot, I commissioned her to paint my Buick parked on the Malecon, Havana’s seaside boulevard. None of it is in the least far-fetched. It’s inevitable and it will happen soon because American business can’t resist a virgin market like Cuba. 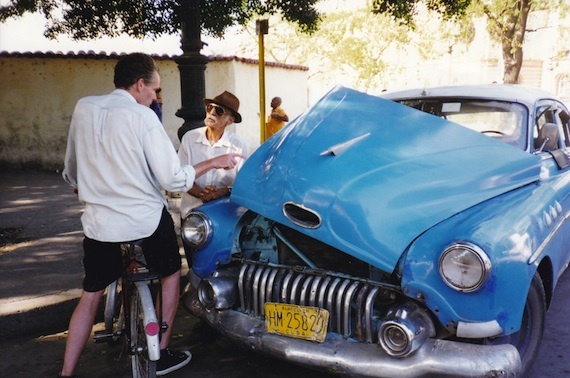 Which makes me glad, all over again, that I got to see Havana Motor Club and I got to go to Cuba back in the day, got to bicycle through the streets of Havana and meet people like Jorge Gallarde and Ramon Velasquez and listen to stories about their Buicks. Before long, the Malecon is going to look like it looks in Oneida Peña’s painting — only instead of old Buicks it will be full of shiny new Cadillac Escalades and KFC and McDonald’s restaurants, maybe a Starbucks and an Apple Store. That’s what’s known as progress. Vivid piece that appeals to the outlaw in me. What strikes me especially is the seeming disconnect vis-à-vis the trepidation over the inevitable return of American capital and the love for “Detroit Iron”. Thanks for this outstanding piece. Il’ja – Thanks for reading, and writing. To answer your question, yes, there was a lot of Soviet tin sputtering around the streets of Havana when I was there. In fact, there’s a priceless scene in “Havana Motor Club” when a Lada and a Moskovitch do some door-to-door combat on the quarter-mile. It’s like watching a wheelchair race at the geriatric center. And as for a Volga being “just like a Buick, but ideologically superior” – you should’ve been a Mad Man. Thanks again for supporting The Millions. I see a great blue heron, flying north, and as we pass each other, I stifle an urge to say, Turn around, bird, New York City -- where anything is possible, where it's cruel but magical and big things can still happen -- that place is SOUTH.